A new exhibition shows the artistic potential of quilting. Quilts are more than a bedspread or a decoration to hang on a wall in a country craft store. Quilts are a true art form, a theory the Westmoreland Museum of American Art in Greensburg, Pa. intends to demonstrate with its latest exhibition, Circular Abstractions: Bull’s Eye Quilts. The touring show, which first opened at the Muskegon Museum of Art in 2016, showcases 41 machine-made quilts by 32 artists from across the country, including one in Pittsburgh. Curated by renowned fine art quilt maker, Nancy Crow, the displayed works take a traditional pastime in a contemporary direction. The show challenged the artists to experiment with and reinterpret the bull’s eye pattern, a four-quadrant design with a bull’s eye at the center of each quarter. Some pieces, like City Lights #1 and Higgeldy Piggeldy #2 by Penn State quilter Patricia Altenburg, took the pattern in a Cubist direction, while others re-imagined it into highly technical, kaleidoscopic compositions. “The interpretations are not in the spirit of traditional quilts, where they are small squares that are repeated over and over,” says local quilter Stefani Danes, whose piece titled Round and Round is featured in the exhibit. Stefani Danes at work on a quilt. 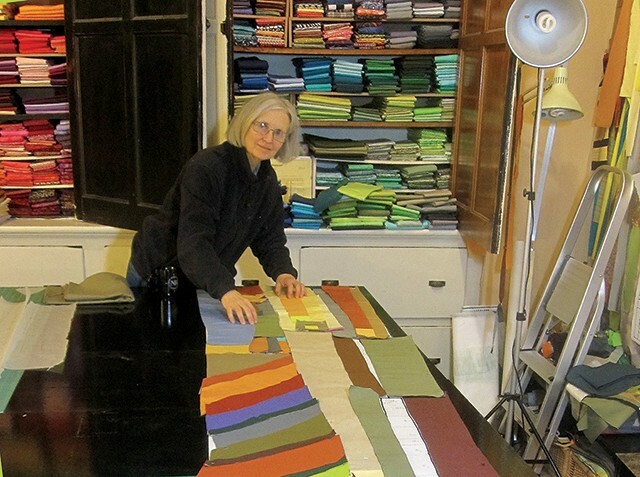 Although she’s a lifelong seamstress, Danes, a professional architect who teaches part-time at Carnegie Mellon University, did not start quilting seriously until 12 years ago. After taking quilting classes with Crow at the Crow Timber Frame Barn art retreat in Ohio, Danes started designing her own original pieces. “In a way, quilts for me were a combination of the pleasure of sewing and the real attraction that I’ve had to designing in architecture,” she says. Besides creative fulfillment, Danes says she has also found a community of professionals who, like herself, took up quilt-making as a sort-of retirement activity. They come from a variety of backgrounds – a few she’s met include an aeronautical engineer, a neuroscientist, the former attorney general of Alaska, and a former provost of the University of Pennsylvania. “We all feel that it’s such a gift to have this opportunity to do this work when you decided that you’ve had enough of whatever else you’re doing,” says Danes. Quilting holds a special place in the history and culture of Pennsylvania. Traditionally, the Pennsylvania Dutch – the name given to early German settlers and their descendants – made quilts from leftover scraps of cloth and presented them as gifts for special life events like weddings and births. But what started as a useful way to recycle fabric has evolved into a legitimate art form, including among artists in Pittsburgh. 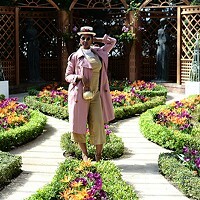 Tina Williams Brewer, a Homewood-based, African-American fiber artist, specializes in quilt-making. Known for her artistic exploration of African-American history and culture, Brewer uses symbolism and textiles to create story quilts that reflect issues of family, women and children, and spirituality of the culture. For her work, she recently received the 2018 Pennsylvania Governor’s Award for Artist of the Year. 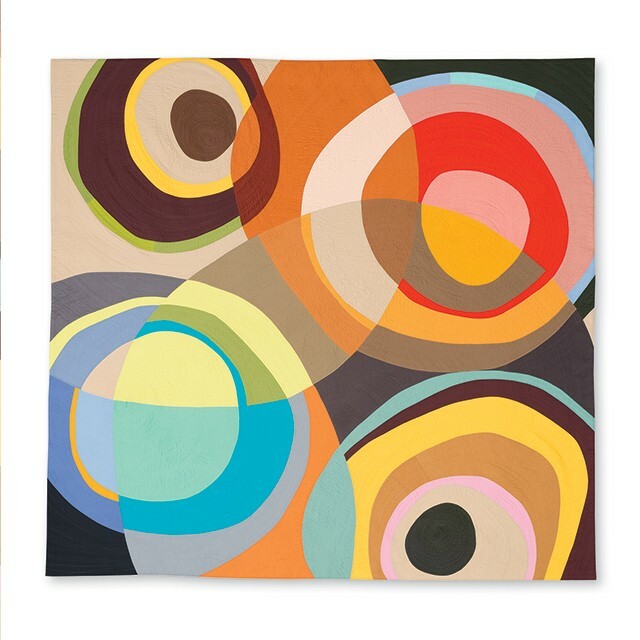 On Jan. 20, 2019, Brewer will present a quilting workshop as part of Circular Abstractions. Besides style, the artists also differ in their quilt-making process – for example, some artists hand-dye their fabric, while others purchase it pre-dyed. All the quilts contain three components: a top layer compiled from individually cut pieces, a soft middle batting, and a backing. “It’s like a sandwich – cotton on the top and bottom and then some kind of fuzzy stuff in the middle,” says Danes. But because the size of quilts can be too unwieldy for home sewing machines, quilters enlist the help of large, industrial longarm quilting machines for the final step of sewing all the pieces together. As a result, the show seeks to demonstrate how far the art form has evolved from the hand-stitch days of quilting circles.